These healthy tacos come together so quickly that you can make them before you finish your first glass of wine. 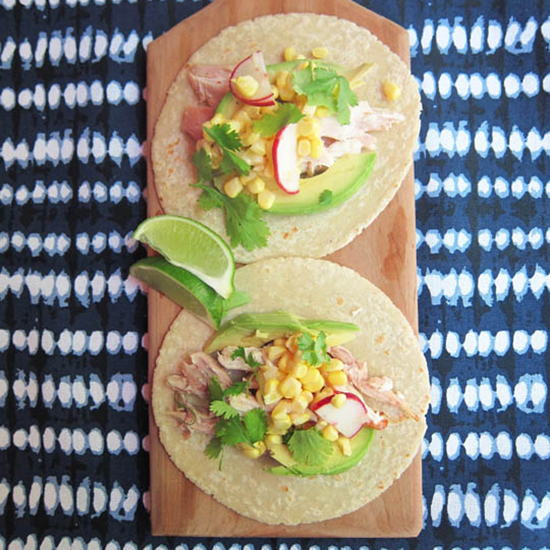 These quick tacos, which call for store-bought rotisserie chicken and a raw corn salad, are perfect for hot summer nights. The only “cooking” recommended (though not required) is for the tortillas, which are infinitely better when warmed in the toaster oven or in a dry skillet. An easy-drinking, fruity white is your best bet here. I opted for an aromatic Torrentés from Argentina. 1 Hass avocado, thinly sliced lengthwise. 1. In a bowl, mix the onion with the lime juice and pickled jalapeño and let stand for 5 minutes. Using a serrated knife, slice the corn off the cob and add it to the onion. Add the olive oil and radishes to the corn and toss; season with salt and pepper. 2. Add about 1/4 cup of chicken to each tortilla and mound the salad on top. Arrange a couple of avocado slices alongside, garnish with cilantro and serve with lime wedges. One serving 440 cal, 23 gm fat, 1.5 gm sat fat, 39 gm carb, 7 gm fiber, 23 gm protein.